Unlikely Heroes: 37 Inspiring Stories of Courage and Heart from the Animal Kingdom by Jennifer S. Holland. Review: Have you ever heard of a parrot saving a little girl from choking? Well, it happened. You can find this story and many more in the book Unlikely Heroes by Jennifer S. Holland. It contains 37 inspiring stories about animals coming to the rescue. Unlikely Heroes. They aren't just firefighters or policemen. They are animals. In this book, they save their owners, children, or other animals. It really can open your eyes as you learn how amazing these animals really are. Unlikely Heroes is for animal lovers. Some animals in this book sacrificed safety or even life. I enjoyed this book a lot. It would probably be best for a 6th grade or higher reading level. The stories are heart-warming and they are considerably long and with advanced vocabulary. But the stories are very memorable and unique. The way the stories are written in the book are so suspenseful and amazing. I found it astonishing how they are all true and animals do acts of bravery like this. It includes where and when each inspiring story happened. Good news for fans of this book- there are 2 other books, Unlikely Friendships and Unlikely Loves. Animals come around at the right time just to do something shockingly great. Every one of them contains someone in danger, and a little furry friend with a lot of heart. We would like to thank Workman for providing a copy of Unlikely Heroes: 37 Inspiring Stories of Courage and Heart from the Animal Kingdom for this review. 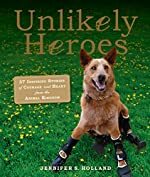 Have you read Unlikely Heroes: 37 Inspiring Stories of Courage and Heart from the Animal Kingdom? How would you rate it?